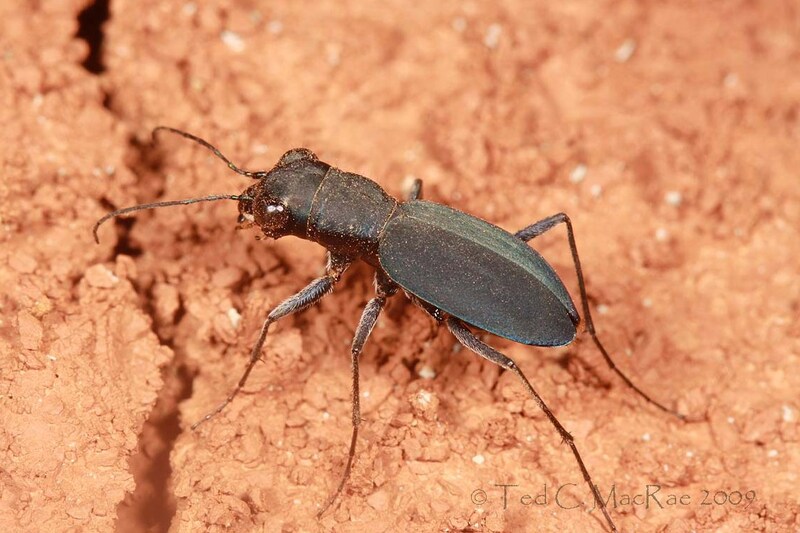 As my colleague Chris Brown and I continue to study the tiger beetle fauna of Missouri, one of the species we have become very interested in is Dromochorus pruinina (frosted dromo tiger beetle). 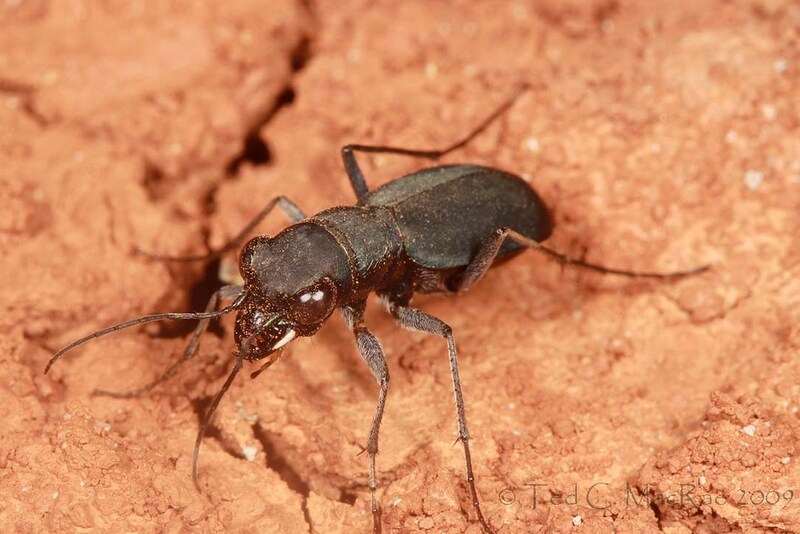 This is another of North America’s more enigmatic species and is one of a handful of species in Missouri – along with Cylindera cursitans (ant-like tiger beetle), C. celeripes (swift tiger beetle), Habroscelimorpha circumpicta johnsonii (Johnson’s tiger beetle), and Cicindela (Cicindelidia) obsoleta vulturina (prairie tiger beetle) – whose highly restricted distributions within the state make them worthy of special consideration for conservation (see Saving Missouri’s tigers and Revisiting the Swift Tiger Beetle – Part 3). Of these, D. pruinina appears to be the most highly localized – thus far we have found this species only in west-central Missouri along a 2.5 mile stretch of roadside habitat in Knob Noster State Park. This tiny population is not only the easternmost known occurrence of the species, but is also disjunct from the main population in Kansas, Oklahoma, and Texas by nearly 100 miles. As a result of this extreme localization within the state, the species has been accorded a conservation status in Missouri of S1 – the state’s highest conservation ranking. Dromochorus pruinina is secretive and easily overlooked, and as a result little is known about it – in fact, the larva was unknown until just last year (Spomer et al. 2008). There has also been little agreement on what to call it – many authors (e.g., Freitag 1999, Pearson et al. 2006) have considered it a synonym or subspecies of D. belfragei (loamy-ground dromo tiger beetle) from Texas; however, Spomer et al. (2008) and Erwin and Pearson (2008) consider it a valid species based on its smooth elytra in contrast to the granulated elytral surface of D. belfragei and the apparent lack of intergrades in central Texas where their geographical distributions overlap. It was one of the species I had hoped to see during my early June visit to The Nature Conservancy’s Four Canyon Preserve in northwestern Oklahoma; however, I would not see this species there despite its abundance of exposed red clay slopes. Following that visit, as I sat in a coffee shop in north-central Oklahoma trying to predict where the pounding rainstorm outside was least likely to spoil my collecting plans for the next few days, this species again came to my mind when I decided to go back to the red clay/gypsum hills just north of Four Canyon Preserve – where I had just seen the even more enigmatic C. celeripes. I noted that this corner of Oklahoma was just at the western edge of the distribution given by Pearson et al. (2006) for the species, but still read through the notes on its habits and habitats in the off chance that I might still encounter it. 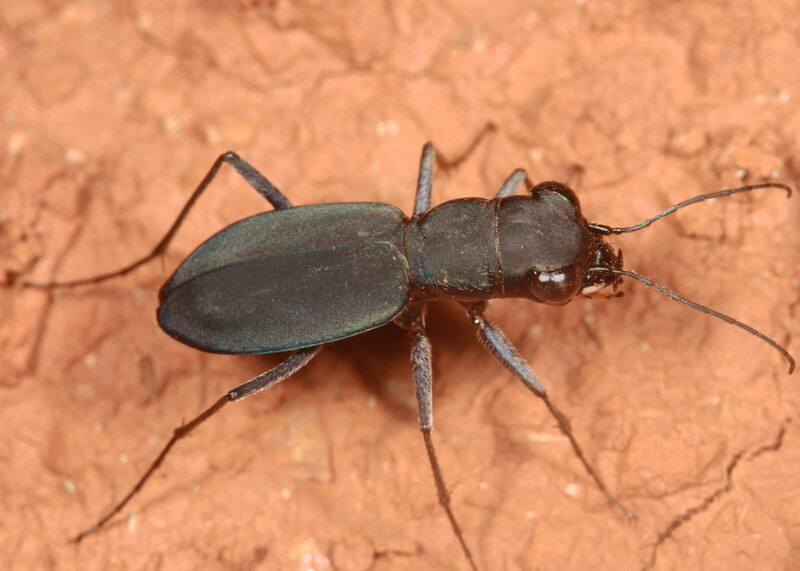 Despite all the forethought, it was nevertheless a surprise when an adult bolted across my path soon after beginning my search of the Gloss Mountains the next day (see Revisiting the Swift Tiger Beetle – Part 2). Like C. celeripes, this species is flightless and runs swiftly – perhaps even more so – as it dashes between clumps of vegetation before disappearing. It’s larger size would seem to make it easier to capture than C. celeripes, but that is not the case, yet I still managed to capture all three individuals I saw during the course of the several hours I spent on the lower talus slopes at the Gloss Mountains Scenic Overlook that morning. With none of them could I even make an attempt at field photographs – their repeated mad dashes for cover eliminated all opportunity. I placed the three individuals into a terrarium of native soil, resigned that I would have to settle for photographs in confinement (there is nothing wrong with confined photographs, which look every bit as natural as true field photographs – still, there is just something about not succeeding in photographing the subject in its native habitat). I returned to the Gloss Mountains late in the day and completed my search for C. celeripes in the State Park across the highway (and also saw my first massasauga rattlesnake). By then it was about 7:00 pm, and my thoughts turned back to the D. pruinina I had seen across the highway earlier that day. I recalled the tendency of the Missouri population of D. pruinina to be most active in the few hours before dusk and decided to have another go at them. No sooner than I had begun to climb the talus slope did I see another one – he bolted into a grass clump, and despite my best attempts to tear the vegetation apart he was gone. Frustrated, I got up and started walking up the slope again – and saw another one, with the same result! Now I was mad. I started searching the rankly vegetated clay slope with determination, and it wasn’t long before I saw a third individual higher up on the slope. It was then and there that I decided I was going to get a field photograph. I stopped dead in my tracks so as not to further disturb the beetle, and carefully took off my backpack and put my camera together as I kept a watchful eye on him. Once ready, I moved slowly toward him – and he bolted. This time I managed to catch him before he disappeared. Okay – I’ve got one in the hand, now what? I decided to try the time-out trick – placing him in the middle of an open area on top of the small mesa and covering him with my camera lens cap. With luck, being covered momentarily would cause him to “settle down” long enough for me to get some shots. I waited a few minutes, then carefully lifted up the lens cap – out he bolted with a vengeance. Time for a new strategy. I started blocking his path with my free hand everytime he tried to run out of the open area I had designated for him, hoping that he would eventually tire and rest momentarily – this was the strategy I successfully employed to get my first field photographs of C. celeripes the day before at Alabaster Caverns (see Revisiting the Swift Tiger Beetle – Part 1). I did this for several minutes, and the little bugger just refused to settle down. Finally, as I took my eye off of him for a split second, he disappeared into an adjacent grass clump and was never seen again. By now I was so frustrated that I considered giving up. Of course, I couldn’t – there was still daylight, and if there’s one thing I’ve learned in this game, it’s persistence. I started walking back down the slope searching for another individual, and right at the edge of the vegetated area I saw one running for cover. This time I cut him off at the pass and forced him to run back towards the more open area of the upper slope. Once out in the open, I continued to follow him as he nervously ambled across the slope into and out of erosion channels, looking for a place to hide. Everytime he siddled up against a chunk of clay or tried to crawl into a crack I forced him out. In the open expanse of the upper slope where I had him trapped, he eventually started pausing – not for long, but just long enough that I could get a shot or two in before he started running again. Eventually, I got several shots that I thought might turn out acceptable. I briefly looked at my camera to try another setting, looked up, and he was gone! By now it was past 8:30 pm, and the sun was sinking fast. I decided that I had given it my best effort, and that whatever shots I had would have to do. I share with you here three of the five shots that I kept. Photo details: Canon 100mm macro lens on Canon EOS 50D, ISO 100, 1/250 sec, f/14-16, MT-24EX flash 1/4 power through diffuser caps. This entry was posted in Cicindelidae, Coleoptera and tagged beetles, behavior, conservation, entomology, Great Plains, insects, Missouri, nature, Oklahoma, prairies, science, taxonomy, tiger beetles. Bookmark the permalink. I appreciate your persistence. It’s a beautiful species- the elytra look like they have a satiny texture. On Saturday, I should be out at Willcox Playa collecting and shooting photos. It will be my first visit with my new camera. I’m really hoping to get some better images of Cicindela marutha, and hope to have the opportunity to check out a bunch of other species, as well. Hi Doug. I often hum a little diddy about persistence when I’m ready to give up on something – it has often made the difference on finally getting what I was after or not. Good luck in AZ – I’ve been there a number of times myself but not since I’ve gotten interested in tiger beetles and, thus, haven’t made it a point to visit Wilcox Playa. That will be stop #1 the next time I do go. p.s. Yes, the elytra do have a satin sheen. In low light it looks more velvety, but the flash brought out the sheen as well as the faint purplish band around the outer margin of the elytra. Who knew a black beetle could be so beautiful?! We can appreciate the frustrating nature of trying to capture some of these creatures on camera. Especially some of the quick-moving beetles! We’ve been trying for a while to get a close-up photo of what we call a ‘teleportation beetle’ — minute black critters who jump with such force and speed that they seem to instantly disappear from view. Every time we think we have a photo, they ‘teleport’ away. I am just wondering if these tiger beetles dart down cracks into the soil under the plants after they are approached and dart off to the nearest grass clump. Maybe a small spade, trowel or shovel would be a useful addition to the net and camera! By the way, theres no shame in setting up animals for photography in the laboratory. Time is valuable and photography of some insects in the field may be near impossible. I am almost sure that is what’s happening – the individual in the photos kept trying to crawl into cracks in the ground while I had him trapped out in the open, and the way the others just disappeared after bolting into a grass clump had me suspecting they went subterranean. I have no moral qualm with staged photographs, and if that is the only way to get it then so be it. I do, however, feel a sense of accomplishment from getting shots in the field with completely unmanipulated subjects – especially when persistence and deep understanding of the subject and its behavior were required to get a particular shot. I’d probably not derive nearly the satisfaction from photographing a dozen tiger beetle species caught and staged as I did from these three photographs of a single species out in the wild. Hi Ted, I’ve been looking back at Alex Wild’s articles and now this article that discuss technique. I had my own frustrating attempts at a tiger beetle photography last week on the bed of a dried-out alkaline pond near Edmonton. (articles coming soon) but I’m afraid I have nowhere near your amazing persistence! Well done. Am I correct in thinking you literally caught the beetle with your bare hand and not a net? wow! And perhaps you could share your little persistence ‘diddy’? Thanks, Adrian – my persistence is the result of early lessons by an influential mentor – the late, great buprestid-collector Gayle Nelson – and years of practicing what he taught me. For flightless tiger beetles, such as this one, the only way to catch them is with the bare hand. Their ability to elude and disappear is stunning, and only after missing quite a few and learning their behavior does success start becoming (somewhat) routine. For tiger beetles that fly, catching with the bare hands is possible (and I’ve done it on a number of occasion when I found myself without a net handy), but it’s not near as easy as using a net. The different species vary tremendously in their wariness, with some being quite easily captured and others almost impossible to approach closely enough. Some tiger beetle collectors use wasp/hornet spray, which immobilizes them pretty well; however, I am personally reluctant to resort to such a technique. I not only object to the idea of indiscriminately spraying poison into the habitats that I hold so dearly, but part of me feels that it is unsporting – almost like cheating. If I can’t catch them honestly, it’s almost like I don’t deserve to have them in my collection. The diddy I sing is something I remember from a Woody Woodpecker cartoon as a kid – I don’t remember any details of the cartoon storyline, but Woody had just done something that required persistence and sang to himself in a catchy little tune, “Oh, persistence is the thing you gotta have.” I’ve tried to find that song a few times but always came up empty – it exists only in my head, I guess! I’ll be anxious to see your tiger beetle photographs.